Used with the permission of Agenda Editions. All rights reserved. if they were valued living.' Wuthering Heights, Chapter XII. There have recently appeared in print letters, or extracts from letters, from David Jones to his friends, that have thrown light on many facets of the man and his works. Reading these has stimulated me to re-read a number of letters I received from him over a period of twenty years; and I think it possible that others may be interested to read passages from the letters I have preserved which illustrate (and, I trust, bring alive) some of the qualities of that remarkable man. There are, of course, others who knew him more intimately and for a far longer time: but that does not in itself detract from the interest of the letters. From January-April, 1955, I lived at Northwick Lodge, Harrow on the Hill, where David Jones had already lived for some years. When I first met him, I had only very recently graduated from Merton College, Oxford: David Jones had, eighteen years previously, published In Parenthesis, three years previously, The Anathemata, and there was currently on view an exhibition of his works at The Tate Gallery. This will set in perspective the requests he makes in the letters for information and opinion about this or that. He was, as René Hague remarks, one of those people with 'a gift of making their friend feel that he is more gifted than he is'. His loathing for dogmatism and pretence made him self-effacing and tentative, even on the wide range of topics on which he was (though he wouldn't believe it) expertly informed. From the time I was at Northwick Lodge, we kept up the friendship with occasional letters and visits until his death. While I was deciding which passages to include, I chanced to read again the obituary in The Times; and I think that the extracts I have made may serve to illustrate several of the points made in that obituary. I am therefore taking a passage from it as a kind of 'text', to give some form to what follows — because, however much one attempts to group the extracts under specific heads, they spill out and overlap. To use David Jones's word, they 'meander', in just that delightful way that his conversation meandered through many areas of discovery and re-discovery. 'The Anathemata', writes the author of the obituary, 'which appeared in 1952, is an awe-inspiring but demanding work. If read (preferably aloud) four or five times by a person of scholarly attainments the reason for the superlatives it has evoked will be understood... David Jones is never deliberately obscure in his language or recondite in his imagery. Indeed, he always manifested an almost exaggerated humility towards learning in others. He regarded himself as a self-taught monoglot; called his writings "meanderings" ... But the fact is that he absorbed more from his wide reading than 99 per cent of scholars get out of theirs.' It will become evident from the passages I quote that what some may regard as 'recondite' was certainly not self-consciously obscure. It is perhaps too obvious to state that the history and mythology to which he directs us were in him part of a living and continuing culture: these things were precious agalmata, in imminent danger of literal and metaphorical levelling to the ground in an age of technology. I shall keep the commentary to the minimum. The letters speak for themselves for the most part — though I have attempted to reconstruct the situation that prompted some of the discussions, lest they should come across with the inconsequentiality that would appear if one were to listen to only one speaker in a dialogue. Literary and philological discussion is common in the letters. I earlier remarked that David Jones hated dogmatism and pretence. His favourite phrase, often after he had explained some intricate detail concerning archaeology, or history, or etymology or the like, was, 'But nobody knows anything about anything'. This was modesty, but not false-modesty, for he was acutely aware that opinions that seem irrefutable today may be challenged or proved wrong tomorrow. I am reminded of a passage from a letter to René Hague: 'Only the other day I heard a young man speaking [about history and archaeology] on the radio, in the most confident and supercilious manner... it was the confident know-all voice that I found most objectionable'. It is against this kind of background that we should read some of his assertions that he is, to use his own endearing phrase, 'such a nitwit'. '... I think you are right — my impression is (got from sources I've forgotten about) that the chaps lit the New Fire outside the south door & came in & having lighted the "exaltet reed" proceed up the nave to the sanctuary where the Paschal Candle is lit. Well, we know all about that — it's this question of the explicitly south door — that you must be certain of before you establish the Macbeth association... However, in the long rubric in the Sarum Missal which, being wholly in Latin, I can do no more than partly translate or try to! I've found a passage which sounds suggestive, it reads: "et ad columnam ex parte australi juxta fontem ubi sacerdos executor officii ignem benedicat qui accendabatur ibidem; scilicet in medio inter duas columnas..."... I can only say that my impression is that of yours, that the south door was the, so to say, porta Xristi. It's terribly hard to check up on these things unless one knows exactly where to look [he here gives several references] ... this Sarum thing — it was compiled & published by the Parker Society — the date on the title page being 1861-1883 (don't hurry old boy!). It is entitled [here follow further references and Latin quotations]... Sorry to be so unhelpful — I see absolutely your point about the Macbeth passage — but we must first establish with absolute certainty the South Door stood in the minds of chaps as symbolizing Porta Xti — just as in Antiquity 'Horn Gate' — as opposed to Ivory gate — was the gate from which Truth emerged. That's what you want, don't you? 'I think we spoke once of how Ben Jonson in his little grammar of the English language, expressed his emphatic opinion that the two "th" sounds had no longer, alas, the distinctive figures ð and þ in written or printed form. This he thought very unfortunate because the differing sounds were most needful. Old Ben J. 's little grammar is almost unknown. He is really angry that chaps should say & write, e.g. "Christ his Church" regardless of the O.E. -es ending. He, B.J., called the introduction of the personal pronoun in such cases "monstrous syntax". It's a bit odd in a way because Ben J. was more or less of the same period when the Bk. of Com. Prayer was if not being written but given slight changes & unless I have forgotten my Anglican childhood & youth & early manhood altogether I seem to recall very clearly hearing from the pulpit or in the saying of the liturgy the words "Xt. his Church". I mean B.J. 's "monstrous syntax" was being used by learned men — all bishops & curates — when reading the Common Prayer." 'Ben becomes positively estatic about 'H' — or rather its aspiration: "The Queen of consonants" he called it, and reminds the reader that it has a great place among the Welsh — how right he was, for in such words as uwchlewyr (high men) or brenhinedd (pl. of brenin king) the h in the plural greatly emphasises the beauty of the word. The feminine name Angharad is a better example, for [the h] lends great beauty to the name — in fact, it's when the aspirate comes in the middle of a word that it becomes, for some reason, especially lovely — though Mam Hawddgar (Mater Amabilis) is lovely too — but on the whole when the aspirate comes unexpectedly in the syllable of a longish word its beauty is best felt, and its absence most damaging. To take a very common & well known example, take away the aspirate from nhadau in Mae Hên Wlad fy nhadau and immediately the whole sound is lost. '... and in 1941 when my father died, though he was... cheerful and vigorous to the last & died of some heart thing at about 86, I again felt a greater sense of loss — for there was loss of my only blood affinity with yr hen wlad & the Bret-Wealas'. 'Agalma' had — fortunately — slipped through. But this was unusual. The letters show that no untidy concept was allowed to pass if there were any means of checking the detail — detail that so often implies the history of things, and how places may have looked in times past. A breed of dog, as we have seen, may call for this attention; or it may be a species of plant on another occasion, as we shall see in a moment. Of course, in both cases, there is more than one point of interest for him: in the corgi query, it is etymology, in the fuchsia query (below), it is perhaps in part the recollection of a place he has known and loved and painted. I had written to David Jones from County Donegal — I was living in Ireland at the time — and had described the landscape of that beautiful place. He replies (see Gaudete letter above, in Agenda appears as plate facing page 64). "I was interested about the fuchsias growing wild — I remember that & also they did on that Welsh island, Caldey, off Tenby — the hedges there were full of fuchsia. I wonder who planted them in these places, for clearly they can't be native'. 'Do they still use red coloured ploughs in Donegal? — I remember friends of mine telling me about them & saying how beautiful they looked against the earth & greenery. I think they said ploughs, not farm-waggons, but I may be wrong. It was a friend of Yeats who told me — 20 years ago'. 'There's a bloody awful fog over all this part of England all today & this night — very thick and cold and stationary and all things outside are silent. Fogs have a way of reminding me always of war, for in a heavy mist in the trenches in the 1st War the tension was greatly increased because you couldn't tell what might be happening out in front of the trench'. One is naturally reminded of the edgy expectancy of the soldiers in In Parenthesis (pp. 61-2): 'With each moment passing — the opaque creeping into every crevice . . . Keep your eyes skinned — it's a likely morning'. The detail of war in the trenches never faded. He told me that when he had his stroke, he unwisely heaved himself on to his bed. He had thought, 'I realize I've had a stroke — but I'm damned well not going to lie in a draught!' This had reminded him of soldiers he had seen, perhaps mortally wounded, yet primarily irritated by some comparatively trivial inconvenience. In many of the letters, he speaks of depression, of 'a devastating weariness' and 'tedious worries'. Sometimes these were of a personal nature — though many of the reasons are spelt out in his poems. At other times, they might be on account of political affairs (and one would be quite wrong to suppose that, because of his seclusion, he was not well informed on such matters). The plate facing page 64 [see Gaudete letter above] reproduces one such allusion: 'All this international political business [the Suez crisis] has impinged a good bit on my mind & I expect on everyone's.' Typically, he would try to make light of his worries, It's a difficult world at times. After which banal remark it's time I stopped!' I hope that the extracts I have taken from letters will help others to return to his works with a fuller understanding of the man who made them. Perhaps they will help, too, to explain why those who met him justly speak with such admira­tion. He was not only a man of genius, but also a man of outstanding gentleness, warmth and humour. His scholarly, discriminating mind and sharp intellect are everywhere evident. Yet the adjective that frequently occurs in the letters is 'wonderful'. David Jones never lost the ability to be filled with wonder at the works of the great makers of art and of literature. I am grateful to David Jones's Trustees for granting permission for the publication of this article. 1. René Hague, David Jones (University of Wales Press, 1975) p. 4. Unfed o Ionawr = 'First of January'. Yn yr hen iaith Gymraeg = 'in the ancient Welsh tongue'. Gwyl MAIR Wenfydedig = 'Festival of the Blessed MARY' (c.f. Anathemata, p. 217 Note 5). Pymthegfed dydd o fis Medi = 'fifteenth day of the month of September'. 5. Langland: Selections from Piers Plowman ed. C. Wilcockson (London: Macmillan, 1965). 6. Piers Plowman Text B, passus xi, 234-5, ed. W.W. Skeat (Oxford: for the E.E.T.S. ; reprinted 1950). 7. Cf. Langland: Selections, etc. op.cit. p. 45 ff. 8. Cf. René Hague, David Jones op.cit. p. 81. 11. Douglas Cleverdon, 'David Jones and Broadcasting', Poetry Wales (Whiter, 1972), p. 72 ff. 13. The construction noun+dependent third-person possessive is recorded (though infrequently) in Middle English. Its employment greatly increased in the 15th century and continued as a popular means of expression until the 17th. For detailed discussion, see Tauno F. Mustanoja, A Middle English Syntax, Société Néophilologique, Helsinki (1960), pp. 159-162. On the subject of the pronunciation of h in Welsh, Jonson first acknowledges Smith's statement: 'Recte quidem in hac parte Graecissent nostri Walli' (= 'Our Welsh correctly follow the Greeks in this point' i.e. sounding the h after a consonant, as in 'Choros', 'Rhamnes', etc.) Smith's further remark, which Jonson quotes, is: 'H. vero κατεξοχην aspiratio vocatur' ( = 'This H is called an aspirate, par excellence'). (Jonson notes that 'h' after P in Greek, 'added a strong spirit, which the Welsh retaine after many Consonants'. He continues, '. . . though I dare not say, she is (as I have heard one call her) the Queene mother of Consonants: yet she is the life and quickening of them'. (Herford and Simpson, op.cit. VIII, 494-5). Thus, on this evidence alone, one could not prove 'that Jonson knew Welsh: he may be simply following Smith. On the other hand, among Jonson's collection of grammars there are two non-Classical — a Hebrew and a Welsh grammar. The latter had been acquired for him by his admirer James Howell, at Jonson's request. Howell was himself a Welshman. The particular volume is now in the Pepys Library at Magdalene College, Cambridge. In this work, Jonson would have found Smith's remarks about Welsh h corroborated (and, of course, Jonson may have noted the Welsh pronunciation at first hand). About the h sound, Davis notes, 'Magna est huius efficacia, frequensque vsus & necessitas apud eas gentes, quae eo vti solent . . . Haec ego respiciens . . . pro primo certe totius Alphabeti elemento ipsum H. merito constituissem.' (John Davis, Cambrobrytannicae Cymraeque Linguae Institutiones et Rudimenta, London, 1592, pp. 16-17). p. 113, line 20: for 'is' read 'is'. This incorrect reading persists in the 1972 edition. The first edition, 1952, reads 'are'. p. 159, line 17: for 'm' read 'me'. Incorrect reading in 1972 editions; 1952 edition was correct. p. 199 note 5: for 'man-now-ud-an' read 'man-now-id-an'. Incorrect reading in 1972 and 1952 editions. p. 209, line 4: for 'i nmaculatam' read 'immaculatam'. Incorrect reading in 1972 edition; 1952 edition was correct. The Sleeping Lord and other Fragments (Faber, 1974). The incorrect 'beyond' persists p. 26. So also 'till' for 'tell' (ibid) p. 32. 'Lle'r', in footnote, has now been corrected. 16. See Preface to The Anathemata, p. 28. 17. 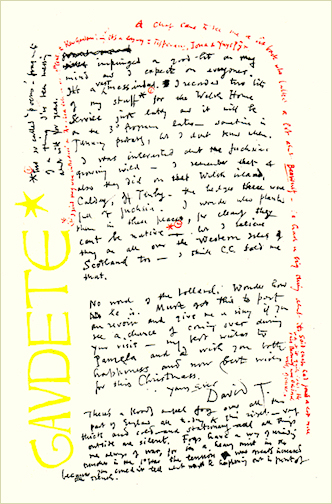 For David Jones's discussion of 'wonder' as perception of the splendor formae see the text of his letter to Mr Saunders Lewis, Agenda, 'David Jones Special Issue' (Autumn-Winter 1973-4), p. 18. (a) 'C.C.' refers to Mr Christopher Carlile who supervised the management of .Northwick Lodge. (c) A personal reference has been expunged from this reproduction. FP Editor's Note: A simple google or wikipedia search will yield many reference websites for the Dream of the Rood, Beowulf, and the various texts of Piers Plowman, including, in some cases, copies of the original manuscripts. And The Norton Anthology of English Literature now has an Audio Readings Archive which offers an audio recording of the Dream of the Rood read by R.D. Fulk.